Lucy and Brad make up and kiss before Lucy leaves for Singapore. Dorothy suggests some international food for dinner, but Phoebe isn't hungry, she's worried about the abortion the next day. Dorothy tells Phoebe it's not too late to change her mind, but Phoebe has been at peace since she made the decision. She'll still be sad, but she's ready. She thanks Dorothy for treating her like an adult. Cameron is trying to persuade operator to give him Jacqueline's number. CAMERON: Yes, I know it's against the law to give outside numbers, I'm a lawyer. Brad comes round to mope about Lucy, he's even off surfing. The phone charges are too high to ring her every day. Cameron suggests something to take his mind of Lucy, like promoting his board, but Brad is just not motivated. He is however persuaded by Cameron's next idea – an all night and all day card game, with pizza. Cameron leaves immediately to get supplies. As soon as he's left Jacqueline rings. Brad answers the phone and agrees to get Cameron to ring back – Jacqueline tells him that Cameron already has the number. Jim leaves the room as the scene opens, giving space for Todd and Phoebe to talk. Todd's a bit down about Lucy leaving, but the conversation swiftly moves on to Phoebe's appointment at the abortion clinic the following day. Todd appears nervous, and is about to confess why when he bottles out and goes to get Phoebe a present instead. While he's out of the room Phoebe goes through to the kitchen to chat to Jim about what the real problem might be. Jim tells her that it's about the appointment, that Todd is part of it too, but that Todd is also worried about Phoebe. Phoebe realises she'd been thinking of herself alone rather than herself and Todd. Todd comes through with the present, a toy seal. He makes seal noises and apologises that he couldn't get a snake. Phoebe thanks him, and they brush any further discussion under the carpet. Brad is looking at the party photos, and particularly at the ones of Lucy. Rick is practising a drum solo, Brad tells him to quieten down as he's “in mourning”. Cameron walks in armed with pizza and announces the beginning of the card night. He blames the delay on women troubles and starts to explain about Jacqueline. Brad then tells him (through mouthfuls of pizza) that she rang, but said that Cameron already had the number. Cameron is livid, and the card night has got off to a bad start already. Jim is visiting Lou and Madge over breakfast, when he refuses a cup of tea Lou says he doesn't blame him, Madge's tea isn't great. Jim tries to calm things down saying it was just a quick visit. LOU: So, it's a rake you're after now eh? JIM: …er, yeah. Fay borrowed mine a while back and didn't return it. Who knows where she – or it is now. MADGE: Haha, she probably flew off on it. The rake's yours Jim. 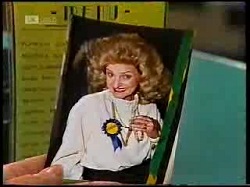 Lou then points out that Jim still has a blow heater he borrowed, and that Madge has been on about getting it back. Both Jim and Madge are embarrassed at the mention, Lucy leaving has caused it to slip Jim's mind. Madge tells Lou to mind his tongue. Lou leaves to get ready for work, and Madge goes to get the rake, leaving Jim in the kitchen wishing he'd stayed at home. 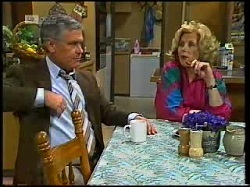 Dorothy opens the door to Todd, and then leaves him to talk to Phoebe. The day has arrived, and Todd is more anxious than Phoebe. He apologises for not being able to go to the clinic with her, saying he'll be there after. 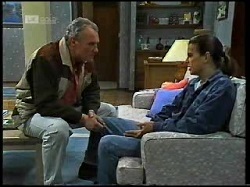 Cameron has organised a visit with Todd's dad, and he doesn't know when he'll next get the chance to see him. They talk about how much this has changed them, how they're now adults. PHOEBE: It's no fun growing up. TODD: It'll probably keep on changing. What we've got won't, ever. PHOEBE: You really think so? TODD: I know so, ‘cos I love you. MADGE: Well Jim, you may see the funny side, but my problem is waiting for all those nudists to see my funny side. Jim sees the problem, although he's still giggling. 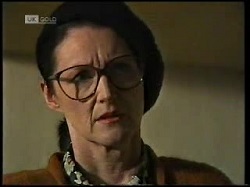 Madge confesses that she thinks Lou will win the bet, not noticing Lou listening in on the conversation in the background. Brad is eating cold pizza, he chats to Cameron about trying to eat his way out of depression. Cameron discovers that cold pizza is the only option for breakfast. Rick comes through to the kitchen and throws his clothes in the rough direction of the washing machine. Although he won all the money at cards he's depressed that the school holidays are nearly over. He's also missing his mum doing his washing. He starts to inspect the trousers that he borrowed of Cameron's to go to the party to decide if they're worth saving with all the spills on them. They notice a strange ink mark, and eventually piece together that it's the backwards imprint of Jacqueline's phone number. Cameron is ecstatic, leaving Rick to comment that he'd hate to see him when he wins a case. 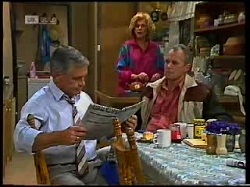 Jim walks in all ready to tell the nearest person about Madge and Lou's bet, but finds Todd deep in thought. He asks if it was a rough visit with dad, but Todd says no, it just got cut short. Jim quickly realises that Todd's having second thoughts about Phoebe's abortion. Todd feels he has no say, that it's Phoebe's decision. He knows his dad's life was messed up when his mum got pregnant, though Jim points out forcibly that Bob's mistakes were mostly his own. Jim tries to talk Todd into chatting things over again with Phoebe, maybe she's also having second thoughts? Todd asks why Jim has changed his mind – he was against them having the baby at the beginning. Jim confesses that he hadn't thought they were mature enough, and that he owes them an apology. Jim offers Todd a lift to the clinic, but needs five minutes. Todd says he'll get there himself in plenty of time and heads out of the door to the accompaniment of some poignant music. Dorothy and Phoebe pull up outside, some women in a nearby car notice them and make a move to get out. As Dorothy and Phoebe walk towards the clinic, the women make themselves known as anti-abortion protesters. They ask Phoebe if she knows that she's about to end a life, Dorothy pulls her away, telling her to ignore them but they push in front again, leaving Phoebe to confront them and get upset. Dorothy tells them that they've made a painful matter worse. Phoebe is shaken and wishes Todd was there. Dorothy reassures her that he's probably already waiting inside. A bus driver is explaining to his passengers, including Todd that the bus has broken down, and that another one will be coming, but it will take at least half an hour. Todd gets off the bus and makes a run for it across a busy highway. He makes it to the central reservation, but the other side is busier, he starts to run along it trying to spot a gap in the traffic. Lou is counting down, six hours to go. Madge wishes he'd stayed at work, but he's staying at home to avoid tempting fate. Madge admits she didn't think he'd make it through, but Lou is enjoying his new found honesty (although he takes her point that he went too far with Jim). She tells him he may as well make the booking at Verity Valley. He says he has a confession first, he doesn't love her anymore. When this sinks in, he cracks a smile and admits he was telling a lie – which means that she's let off the hook. Madge hugs him and thanks him, but he tells her there'll be more bets coming. Madge then realises that they can go to a place of her choice and starts to think. Cameron comes off the phone and tells Brad and Rick that he spoke to Jacqueline's cleaning lady. Jacqueline is away for an indefinite amount of time. Brad is looking through the party photos again, and notices someone hiding behind ‘Frank' the statue. Cameron recognises the ‘spy' as Jacqueline, and realises she must have come to the party after all. They wonder why she didn't come in. The receptionist calls Phoebe through, but Todd hasn't arrived yet, so Phoebe wants to wait. Dorothy offers to get her moved down the list, but Phoebe realises she wants to get it over with. She hugs Dorothy and goes through. Todd has managed to get to the other side, he sees a taxi and tries to hail it, but it's full. He looks at his watch, and then looks up to see an empty taxi on a side road back on the other side of the highway. He looks quickly and then runs out into three lanes of traffic. 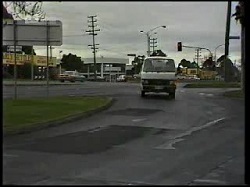 He gets over fine, then runs across the side road to get to the taxi just as a van pulls in to the road at some speed. 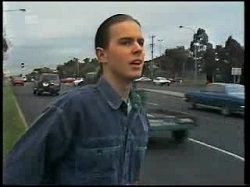 Todd turns just in time to see the van before it hits him, he falls awkwardly to the ground, struggling for breath.